Under the Constitution, the King, together with the ministers, makes up the government. The King represents the Kingdom of the Netherlands at home and abroad. Besides his formal duties, King Willem-Alexander works in the interests of the inhabitants of the Netherlands. As head of state, it is the King&apos;s task to unify, represent and encourage the people. The ministers, and not the monarch, are responsible for the acts of the government, and the ministers are accountable to Parliament for what he says and does. The ministers, who together make up the cabinet, are responsible for decision-making. The King has weekly meetings with the prime minister, speaks regularly with ministers and state secretaries, signs all new Acts of Parliament and royal decrees and ratifies (as part of the government) international treaties. At the State Opening of Parliament on the third Tuesday in September, he delivers the Speech from the Throne, in which the government announces its plans for the coming parliamentary year. The Constitution requires that the monarch appoint, dismiss and swear in all government ministers and state secretaries. In view of this constitutional role, and at the request of the House, the King can be kept apprised of all developments in the formation process. 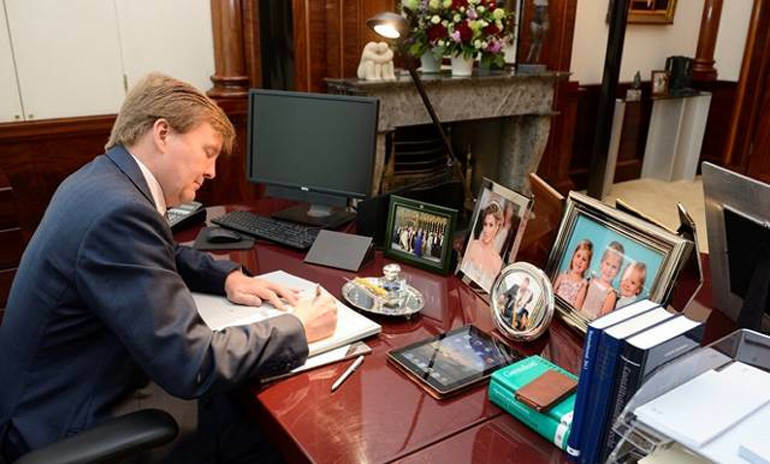 King Willem-Alexander signs laws in his office at Noordeinde Palace. The monarch is officially the president of the Council of State, a historical role which is purely symbolic in nature. The Council of State provides the government and Parliament with independent advice on legislation and governance and is also the country&apos;s highest administrative court. In addition to the plenary meetings attended by the King, the Council of State also consists of an Administrative Jurisdiction Division and an Advisory Division, whose meetings the King does not attend. Accordingly, the King is not involved in practice in the Council&apos;s two main areas of activity. The vice president is in charge of the day-to-day management of the Council of State and presides over its meetings. The King represents the Kingdom of the Netherlands at home and abroad. Besides his formal duties, the King works in the interests of the inhabitants of the Kingdom. As head of state, it is the King&apos;s task to unify, represent and encourage the people.